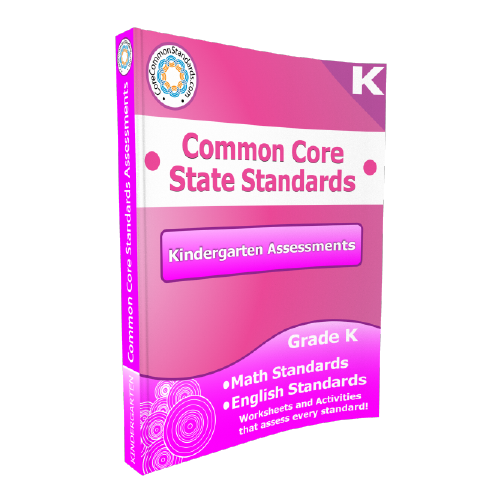 Kindergarten Common Core Assessment Workbook for testing all of the Kindergarten Math Common Core Standards and Kindergarten English Common Core Standards. First Grade Common Core Assessment Workbook for testing all of the First Grade Math Common Core Standards and First Grade English Common Core Standards. Second Grade Common Core Assessment Workbook for testing all of the Second Grade Math Common Core Standards and Second Grade English Common Core Standards. Third Grade Common Core Assessment Workbook for testing all of the Third Grade Math Common Core Standards and Third Grade English Common Core Standards. Fifth Grade Common Core Assessment Workbook for testing all of the Fifth Grade Math Common Core Standards and Fifth Grade English Common Core Standards.